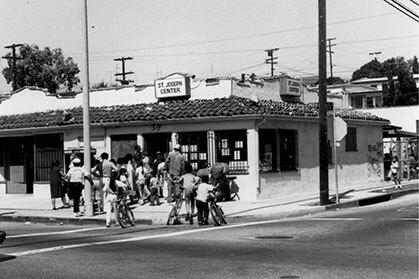 In July 1976, two Sisters of St. Joseph of Carondelet, together with a few volunteers, began providing advocacy and referrals and assisting families with such basic needs as food, clothing, and job readiness on in a small storefront on Rose Avenue in Venice. Services were offered without regard for religious affiliation and with no religious instruction provided or required. From the very beginning, the Sisters saw their task as renewing hope in all people and empowering them to take steps to heal their lives. The original focus of St. Joseph Center was working with low-income families and individuals. But soon the Sisters recognized the growing number of homeless individuals who came into the area in the early 1980s. The decision was made to expand their service, and they leased a nearby facility specifically to serve homeless men and women. In 1986 the Sisters stepped down from the leadership and St. Joseph Center became a separately incorporated non-profit 501(c)(3) organization. Since then, we have continued to expand our programs and our footprint in response to the needs of the communities we serve. Since our founding more than four decades ago, St. Joseph Center has grown into a multifaceted organization. 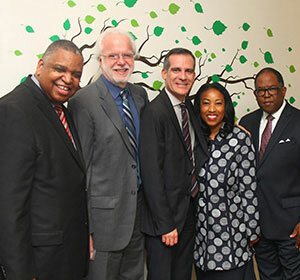 Each year we reach over 10,000 people through more than 25 programs throughout LA County. With a staff of nearly 300 and more than 400 regular dedicated volunteers, St. Joseph Center helps people get back on their feet so they can live their healthiest, happiest lives. We have offices on the Westside, where we lead the Coordinated Entry Systems for Individuals and for Families, and in South LA, Downtown Los Angeles, and southeast LA County (Whittier). 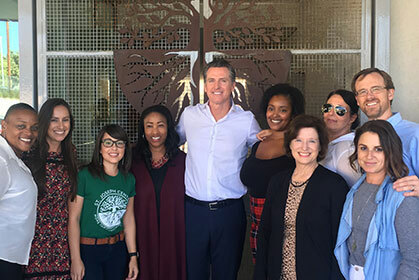 We also provide supportive services to formerly homeless individuals and families in subsidized apartments and housing developments across the region. The diversity of our programs is among our greatest strengths: We provide clients a coordinated and comprehensive web of services designed to make sure that no one falls through the cracks. Our programs are organized into four pillars of service: Outreach & Engagement, Housing, Mental Health, and Education & Vocational Training. Our efforts are designed to be integrally related and supportive of one another, so they form a seamless continuum that helps people rebuild their lives. Hope is embedded in St. Joseph Center’s DNA. We look forward to a time when our services are no longer required, but until that day arrives, our staff, board, and volunteers remain committed to caring for the community’s most vulnerable members with dignity, compassion, and respect.